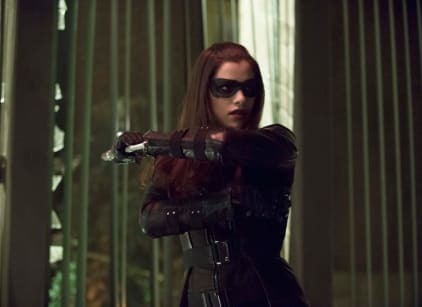 The Huntress returns on this episode of Arrow. Laurel attends her second AA meeting of the day, and has her 30 day chip. It doesn't stop her from picking up a drink when she thinks it might help, but she doesn't follow through. Adam Donner brings in Laurel to try Frank Bertinelli. It's later revealed that he had no authorization to bring her in and he did it only so he wouldn't put any of his attorneys in jeopardy for the fake case against Bertinelli. It was a sting to attract Helena. Huntress takes everyone hostage to try to get to her father and Canary tries to get Laurel out, but when Laurel realizes they'll be leaving the others behind, she refuses to leave. She asks Canary if she'll help or not. All is going well until Canary is bested by Huntress and Huntress later squirrels away with Laurel as leverage. When Laurel is later told her services won't be necessary, she blackmails the office to keep the opportunity she has been given. Roy is out on the street with Canary and Arrow but can't quite control his anger. Oliver asks him to break up with Thea. He initially refuses until he almost hurts someone at Verdant. When she won't accept him breaking up with her, he arranges to be caught kissing someone else. Lance double crosses the cops and gets Frank into a van so they can make an exchange for Laurel. After an epic fight, Laurel keeps Canary from killing Helena. Oliver goes to see Helena, who is unhappy the death of her father didn't bring her any peace. She cries. An unhappy Thea decides to walk home from Verdant, only to be picked up by Slade. Uh oh.